How Can Your Organization Benefit? 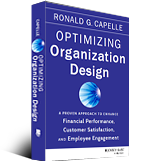 Capelle Associates’ proprietary Optimizing Organization Design® approach is research based and client proven to improve organizational capabilities. This approach can also lead to improvements in other areas such as Board functioning, process management, project management and compensation. Read more about the types of performance improvements your organization can achieve by working with our team. Apart from these performance improvements, our client organizations experience numerous additional benefits. Our research and client experience shows that this approach leads to better financial performance, customer satisfaction and employee satisfaction. It can provide sustainable competitive advantage and deliver a significant return on investment. Many of our clients have made this approach their foundation for both strategy implementation and human resources management. Read more about these additional benefits your organization can enjoy by adopting our Optimizing Organization Design® approach. The two main steps in this approach are (i) Assessment and (ii) Implementation of Agreed Improvements. During the assessment step, information is gathered and analysed in order to make recommendations, prepare a report, and support executive decision making. The approach is comprehensive and efficient, plus it requires very little time from the individuals in your organization. Information gathered from employees, managers and others is analyzed and compared with our benchmarking databases to determine issues and identify opportunities for improvement. Specific, action oriented recommendations, including cost saving suggestions are prepared and reported on. During follow-up meetings, we find that 80% to 90% of our recommendations are accepted due to the robust, research based assessment approach. This minimizes friction and resistance to change, thus creating a strong foundation for successful implementation. “Research done by Capelle Associates shows that optimizing organization design provides average potential annual cost savings of about $2,500 per position times the number of positions in the organization (for a 1,000 person organization, this would be $2,500,000). Organizations can move ahead quickly with optimizing organization design since it is not necessary to “reinvent the wheel”. You have the Capelle Associates team with the depth and breadth of experience required to support you. Your organization can benefit from higher quality of implementation since our methods, materials and skills have been successfully proven over many years in many different types of industries and organizations. You can enjoy cost-efficiencies: 80-90% of the implementation work can be done by your internal team. It is a sustainable process that is transformational rather than project-based. Sustainable results are achieved by managers actively learning the required skills; the development of underlying systems that are required to support the improvements; and an internal team that is trained and qualified to continue the development. To request a discussion with Capelle Associates, please call 416-236-3044 or fill out our online form. Find out more about our Optimizing Organization Design® approach and how it can be beneficial for your organization. Everything that we measure has improved markedly. Our financial performance is up. Our customer service scores are up. Our employee morale and the general attitude around all of this is up … I can say with just absolute conviction that getting the organization design right … has been fundamental to the improvements around this place.